Located in the north, right on the banks of the Mediterranean Sea, Alexandria has one of the most idyllic settings in all of Egypt. 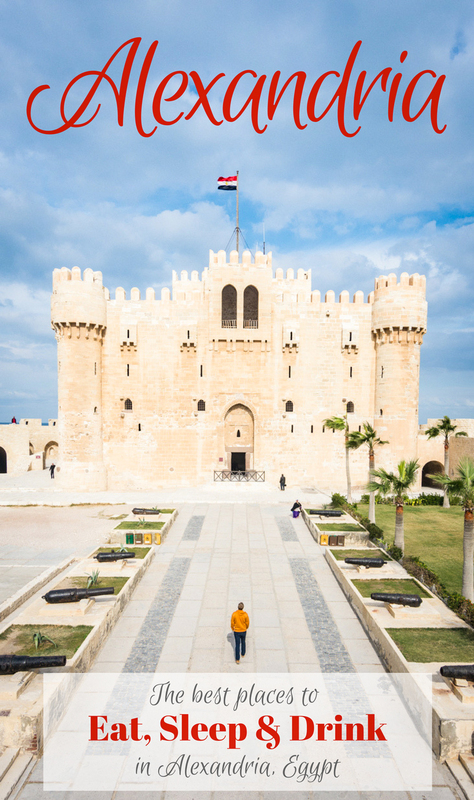 Believed to have been founded by Alexander the Great in 331 BC, Alexandria became one of the most important trading centers in the world from the late 18th century. Sadly, due to several wars, earthquakes, and a massive tsunami, very little of the ancient city survived to the present day. What has remained are a few interesting landmarks to explore as well as some of the most warm and welcoming people you’ll encounter during your Egyptian vacation! “Welcome to Alex!” will be the greeting that you receive from the friendly faces around every corner in Alexandria. As the city is not on the typical tour bus route, you’ll likely see only a handful of foreigners and the hassle-factor among locals is low. If you’ve been to several touristy cities like Luxor, Aswan, or Giza, you’ll appreciate that Alexandria is not heavily dependent on tourism. It will be a peaceful reprise from the hectic touts in the larger Egyptian cities. Spend a few days here eating delicious food, wandering around the markets, and chatting with the friendly locals! The currency in Egypt is the Egyptian Pound (LE). At the time of writing (December of 2017) the conversion rate was about 17.65 LE to $1 USD. We’ll be referring to costs in Egyptian Pounds so just keep in mind that if we say something costs 100 LE, that’s just about $5.50 USD. 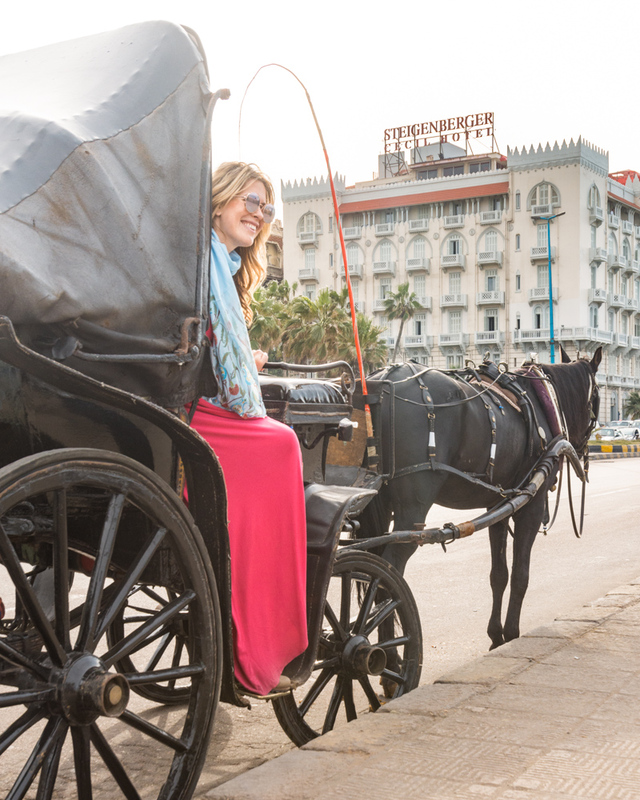 Egyptians speak Arabic and you should learn a few key phrases to get around! “Al Salam Alaikum” (pronouned sall-em wall-a-come) is a nice way to say “hello”. “Shukran” (pronounced shoo kran) is “thank you”. “Ma’-Elsalama” (pronounced ma sell lem-a) is “goodbye”. As with most conservative countries, women are expected to cover their knees and shoulders when venturing out of the house. While many Egyptian women wear hijabs or burqas, foreigners are only expected to cover their heads when entering mosques. Remember, you’re not here to change the culture, you’re here to experience a new one. If you want to avoid the cold and the rain, plan your visit in the spring, summer, or fall. I’ve also compiled a list of everything I packed for our vacation in Egypt here! Borg El Arab International Airport is about 25 miles southwest of Alexandria. Trains depart to and from Cairo regularly or you can hire a driver from Cairo for 600-800 LE depending on how hard you negotiate. The drive should only take about 2.5 hours depending on traffic. A historic landmark that was built in 1929 with spacious rooms overlooking the sea, Steigenberger Cecil Hotel is the ideal place to stay when visiting this beautiful city. 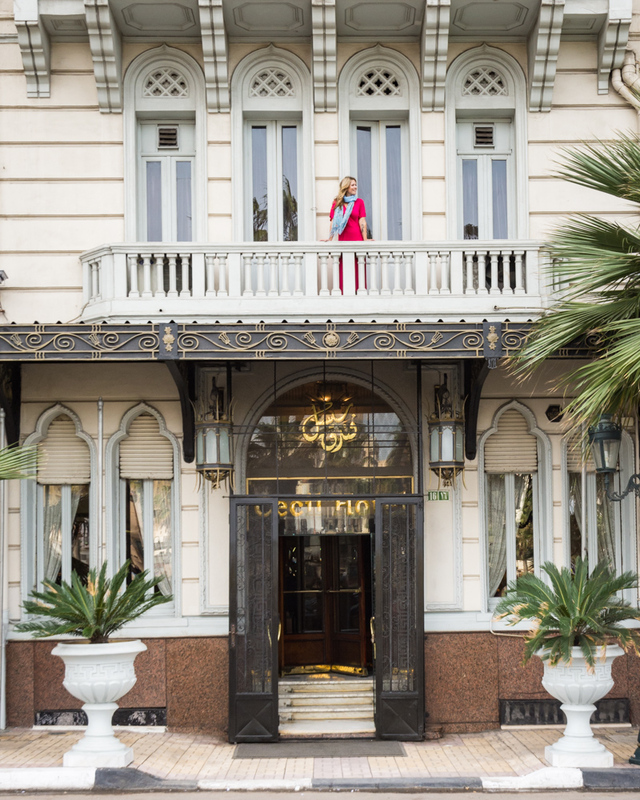 This hotel has been home to several infamous guests including Winston Churchill, Al Capone, and it served as an operations hub for the British Secret Service. 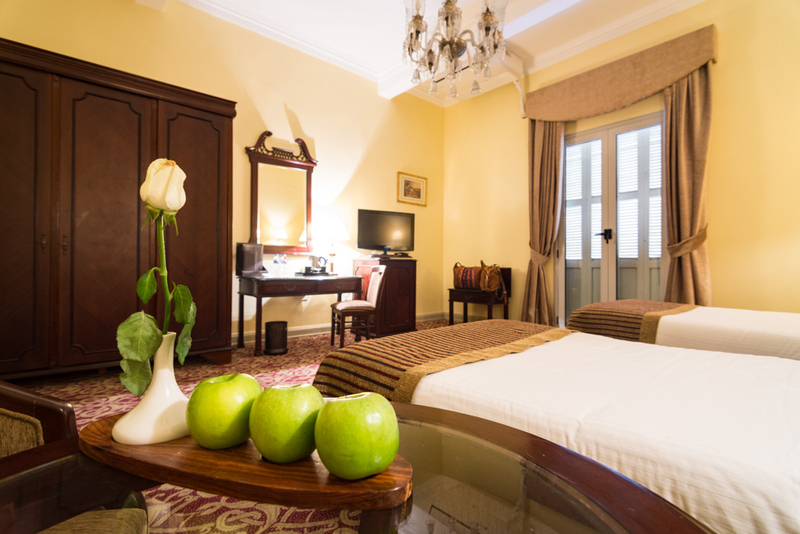 Upon arrival you’ll be greeted by the warm and welcoming staff and then ride the elegant old-fashioned elevator to your spacious room. Evidence of the hotel’s long history is in every detail from the elegant chandeliers to the opulent gold mirrors adorning the walls. And you’ll love having your own private balcony with uninterrupted views of the sea! Start every morning with fresh juices, made-to-order omelets, a selection of breads and cheeses, and treats to satisfy your sweet tooth in the Le Jardin Restaurant off the lobby. And end your days with a glass of wine at China House on the rooftop of the hotel for amazing views of the sea at sunset. If you’re in the mood for a late night, dance the night away at the hip happening nightclub on the first floor – Caesar’s Palace. Alex has no shortage of delectable food options at every price point. We ate literally everything in sight (for research purposes of course) to bring you a list of our favorites! 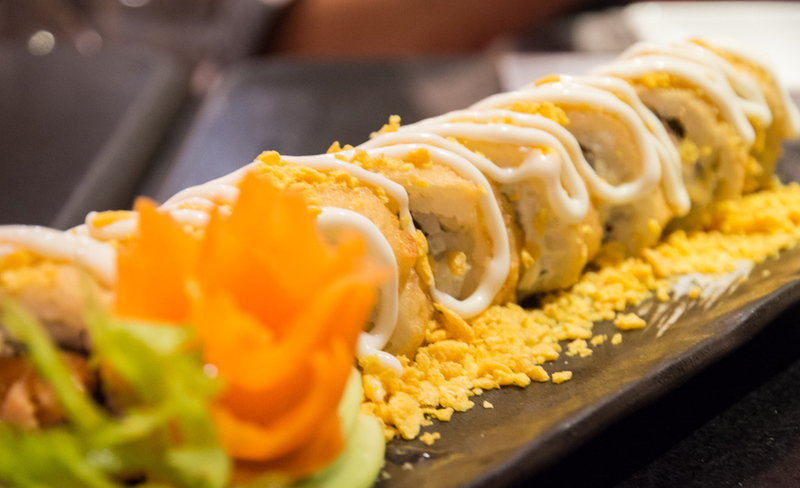 Fresh sushi at Mori Sushi ($$$) – try the bon bon and vegetable appetizers and the salmon sashimi. Foul, falafel, and fried cheese at Mohamed Ahmed ($$) – the best spot in Alex to enjoy an Egyptian-style breakfast. Koshary at Koshary 3la El Sohkhn ($) – rice, macaroni, lentils, and fried onions are mixed together and then topped with tomato sauce and served fast! There’s always a crowd gathered around this popular spot. Pizza and Oreo coffee for dessert at Roastery Restaurant ($$) – a quaint restaurant with comfortable seating and a friendly waitstaff. And if you like spice, you’ll love the chicken tandoori pizza! Seafood at the Greek Club ($$$) – with a prime location right on the waterfront, the Greek Club offers the best seafood in all of Alexandria! 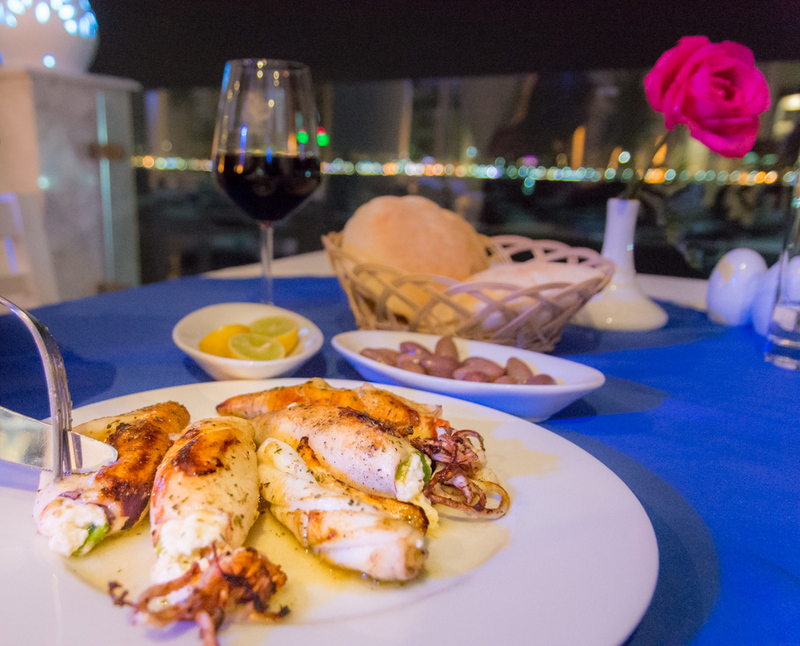 Start with the choriatiki salata and the seafood soup and don’t miss out on the grilled calamari with feta, tomatoes, and green peppers! Be sure to make a reservation for a table with a view. Shawarma at Fayrouz Restaurant ($) – they have the largest rotating spit you’ll see anywhere in Egypt! And the food is delicious and cheap! Savory feteer at Dahab Restaurant ($$) – definitely the best feteer in Alex, arguably in all of Egypt! 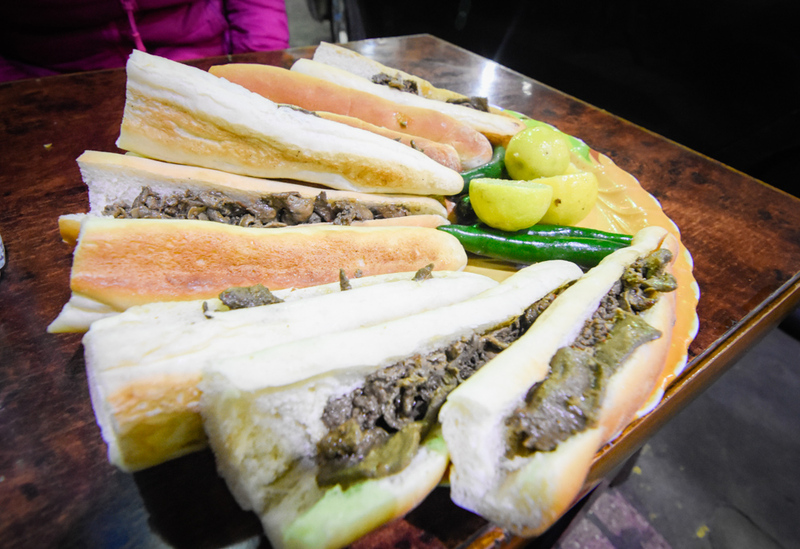 Beef sandwiches at Alflah Restaurant ($) – at 6 LE per sandwich, you can go crazy at the popular restaurant with outdoor seating. Do as the locals do and order a full plate with some potato chips on the side! Sobia at Alban Makka – this coconut-flavored milky drink is heavenly! Carob Juice at Carob Amal – this rich, sweet juice tastes like dried cherries and will only run you 5 LE per glass. Rice Pudding at Gilaty Azza – the perfect end to a delicious meal! Om Ali at El-Sheikh Wafik – phyllo dough or puff pastry, milk and nuts are all added to a bowl and baked until it’s hot and bubbly. 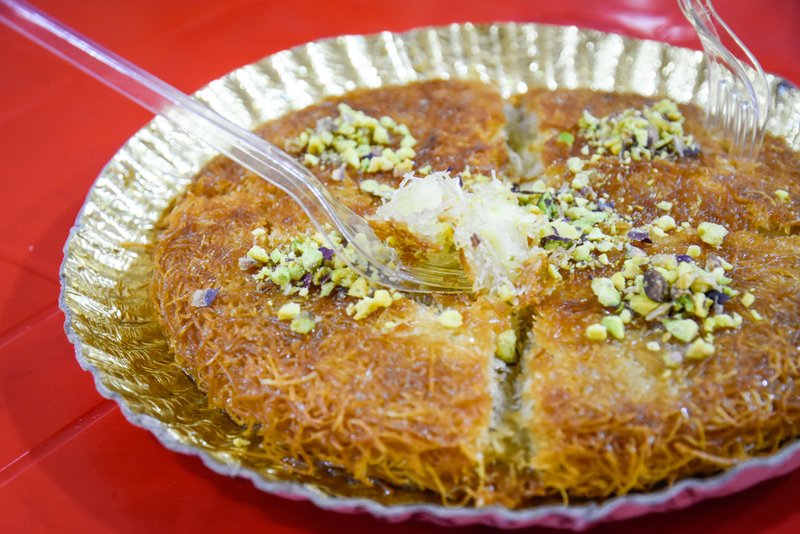 Kunafa at Sweets Syrian Palace – this delectable dessert is filled with cheese and topped with a sugary sweet syrup. You must try one while in Egypt! 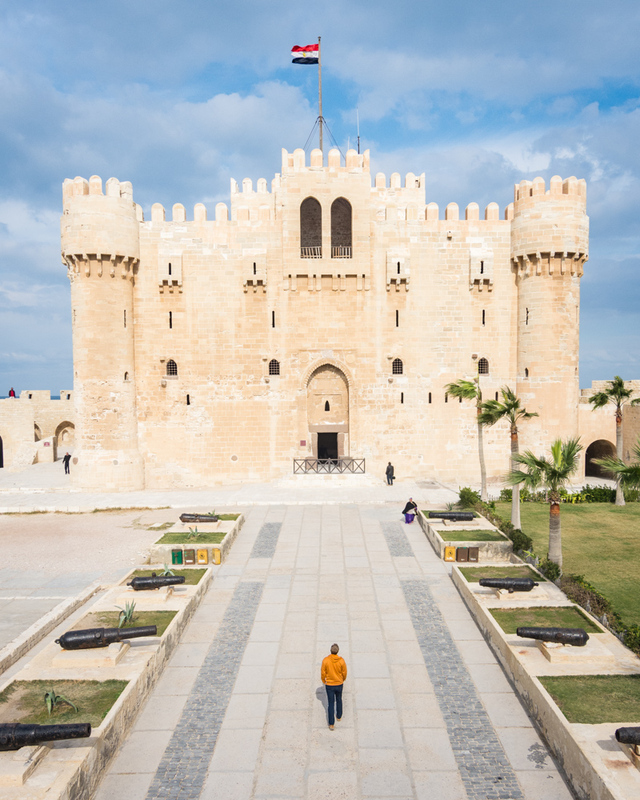 Citadel of Qaitbay (entrance fee: 40 LE per person) – this 15th century fortress was an important defensive stronghold for Egypt. Today it has been restored and provides stunning views of the sea and the city from the fortress walls. There are also several small market stalls lining the street near the entrance. 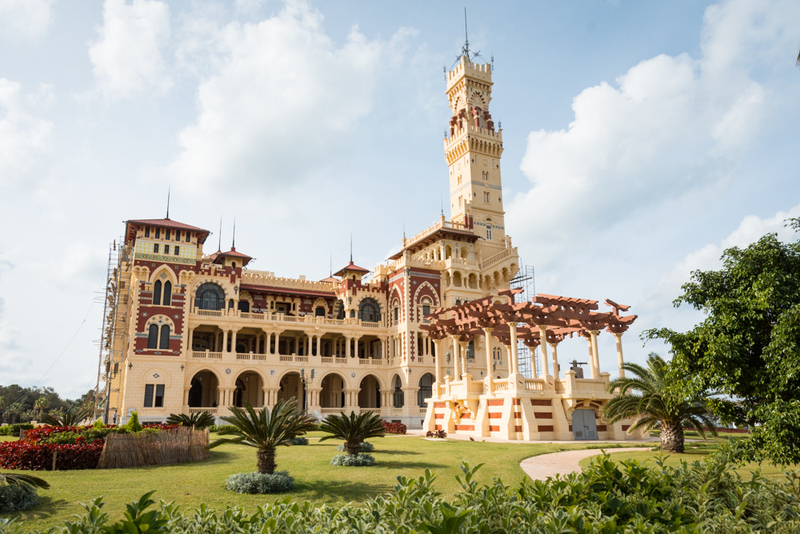 Montaza Palace and Gardens (entrance fee: 15 LE per person and per vehicle. If you come in a taxi or Uber you’ll need to pay 15 LE for the driver and 15 LE for their car to enter the gate) – you cannot actually enter the royal palace but you can wander around in the exquisite gardens and walk along the beautiful (albeit mostly deserted) coastline. Bibliotheca Alexandrina (entrance fee: 70 LE per person) – a beautiful building containing the largest reading room with open bookshelves in the world. Also contains 3 museums and 2 permanent exhibitions. 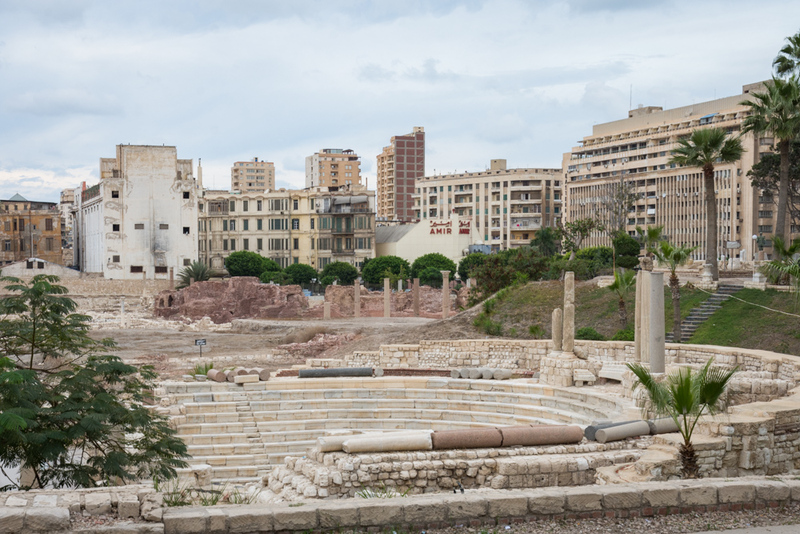 Ancient Roman Amphitheater (entrance fee: 80 LE per person) – this small amphitheater is a short distance from the Cecil Hotel and should only take about an hour to have a walk around the ruins. Kom el Shoqafa Catacombs (entrance fee: 60 LE per person. No cameras allowed inside) – the catacombs were accidentally discovered in 1900 when a donkey fell into a hole in the ground and are the largest-known Roman burial site in all of Egypt. You’ll descend a spiral staircase into the eerie underground tomb. If you Uber or taxi here, plan on some serious inner-city traffic! If you are looking for a great deal on trendy clothes, Alex is the perfect place to get it! The downtown area is lined with clothing and accessory shops offering everything from inexpensive knockoffs to high-end, expensive garments. Souq Ibrahimiyya – head over to this lively souq in the morning to catch vendors slinging fresh produce, seafood, and a variety of meats (both dead and alive). Sayed El Safty – a delightful antique shop full of treasures! Attareen Antique Market – this maze of alleyways is worth braving if antiques and collectibles are your thing. Once you’ve spent a few days in Alexandria, you’ll never want to leave! Previous Post Have Some Fun in the Sun in Hurghada, Egypt! I haven’t heard much about Alexandria before so it’s nice to see a writeup. It’s good to hear that it’s not as crowded and full of hassle like other cities in Egypt seem to be. I would love to visit Egypt for the historical monuments and ruins, but am worried about the level of hassle that you can experience on the streets. 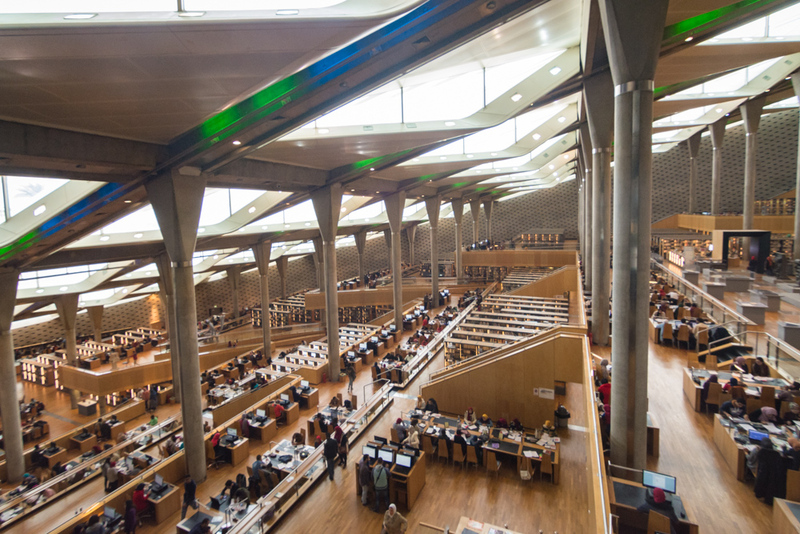 I love the look of the library with the giant reading room in Alexandria too! I’ve always been fascinated by Egypt, and the only reason I know about Alexandria is because a friend of mine as a child was from Egypt, specifically Alexandria, and she moved back there at one point. Anyway, it looks like such an amazing place to explore. Thank you for the packing tips, especially..I always have a hard time with that, and it’s great to know how to dress to follow the customs and culture! I was planning to visit Alexandria during year end holidays and had already enquired for places to stay and explore. Unfortunately the bomb blast happened and our plan got dropped. I would really love to follow your guide when i visit sometime this year. The food and drinks look delicious and I’ll definitely try those. This has me thinking of a return trip to Egypt. I visited Cairo about 7 years ago and loved it. I heard wonderful things about Alexandria as it has so much beauty. The Steigenberger Cecil Hotel looks wonderful and I can see me unwinding after a day of exploring. Oh Alexandria really is wonderful! I don’t get on well with the climate in Egypt, but I could be persuaded to visit here! I love the history of the place, and the Montaza Palace and Gardens look absolutely incredible – that would be the top of my list! We havent read about Alexandria much. It seems like our type of place as there are less tourists, wow. That library is really huge. I must say your post is laoded with lots of information and is a perfect guide for Alexandria, Egypt. Would love to follow it when visiting. Drooling over your photos of the beef sandwich and the grilled calamari. Egypt is a place I’ve wanted to go my entire life. I’ve just always been fascinated with Ancient Egypt, so Alexandria will definitely be on my itinerary when I finally make it there.